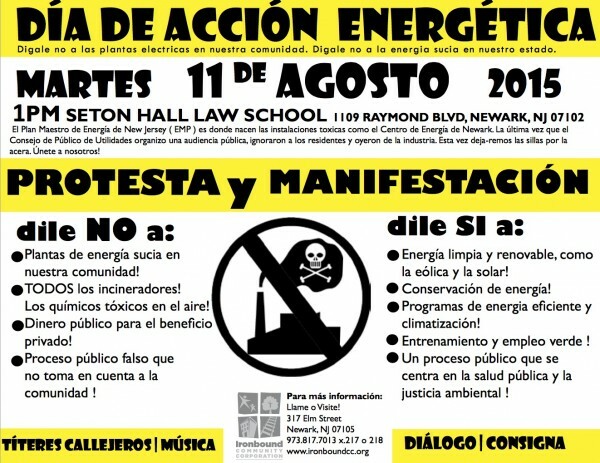 On Tuesday August 11 from 1-3PM please join Newark residents, the Ironbound Community Corporation (ICC) and allies at a peaceful rally and protest outside of Seton Hall Law School (1109 Raymond Blvd, Newark, NJ) where the Board of Public Utilities will be hosting a public hearing to review the NJ State Energy Master Plan created in 2011, which is in the process of being updated. Some community activists will wish to attend the hearing and possibly, to comment – which is an activity rallying protestors wholeheartedly endorse. The Board of Public Utilities (BPU) is putting together the 2015 Energy Master Plan (EMP) which will help determine where we get our energy from in New Jersey. The plan decides New Jersey’s priorities for clean AND dirty energy and can also set limits on how much energy we waste. Compelling statements from environmental justice (EJ) and environmental groups were made before the 2011 plan was adopted. But community voices were ignored, with operation of existing dirty fossil fuel and incinerators not only continuing unabated, but expanding. A new 655 megawatt natural gas plant was situated in Newark’s already heavily polluted Ironbound neighborhood; and several other dirty fuel facilities were located around the state. 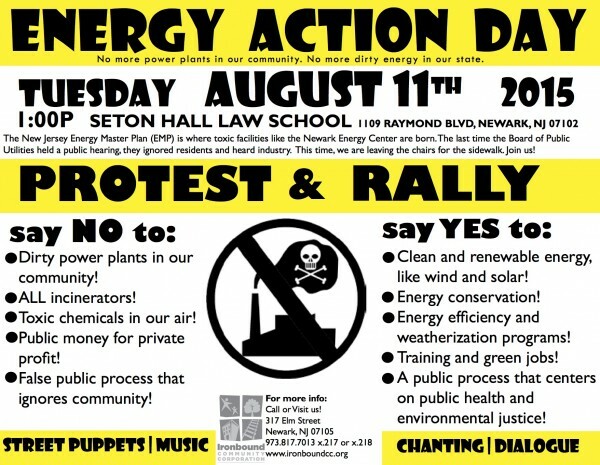 Let’s not allow community demands for clean energy to lose impetus because New Jersey state has recently opted to label as “clean energy” both nuclear energy and fracked natural gas – which are anything but … are also dangerous to the environment and cause health issues too. The last time there were public hearings on the Energy Plan, industry was allowed to speak first and concerned residents spoke at the end when the media had left. We want to make our voices heard by protesting and rallying. The August 11 action will not be about standing around listening to an endless roster of speakers. Instead, there will be activities, performances, music and some fun street puppets as well. Please join in and support #actonclimate! Please email or phone Molly Greenberg at 973.817.7013 x217 or 218 for additional information. Submit a public comment electronically through the Sierra Club’s website. Please feel free to edit any information which already appears in the Sierra Club’s form by adding to it or you can entirely replace their wording with your own. Previous PostCan demand for ethically produced chocolate reduce child labor on cacao-chocolate farms?Next PostWant to become a Palm Oil Action Leader and help stop cookies from destroying our world? Were you at the POP rally last week? I thought I saw you. I’ve added some information to the post, so please take a look!